The Amphicar was developed by Hans Trippel, a German engineer who began developing amphibious vehicles for the military, but it was his dream to develop a civilian amphibious vehicle. In 1959 Trippel debuted his Eurocar at the Geneva Auto show, it was an engineering leap forward, but wasn’t without design flaws. 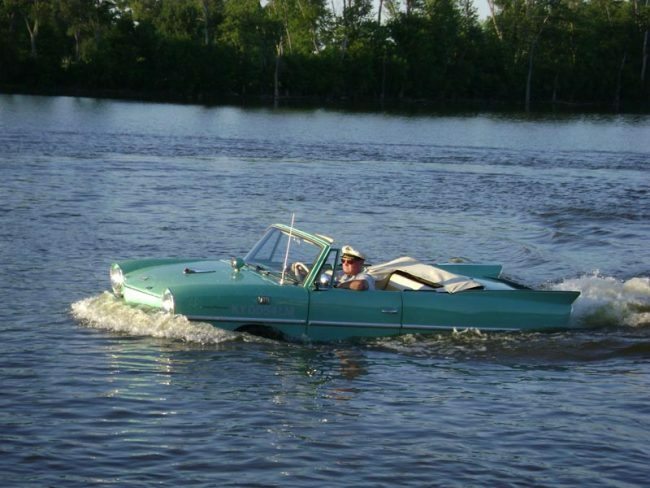 The following year and five million dollars later his Amphicar was unveiled to the public. It was the culmination of over a thousand designs and succeeded where Tripppel’s previous designs had fallen short. In 1961 the Quandt Group under the name of the Amphicar Corporation began production in Berlin, Germany, making the Amphicar the first mass produced amphibious vehicle for the civilian market. 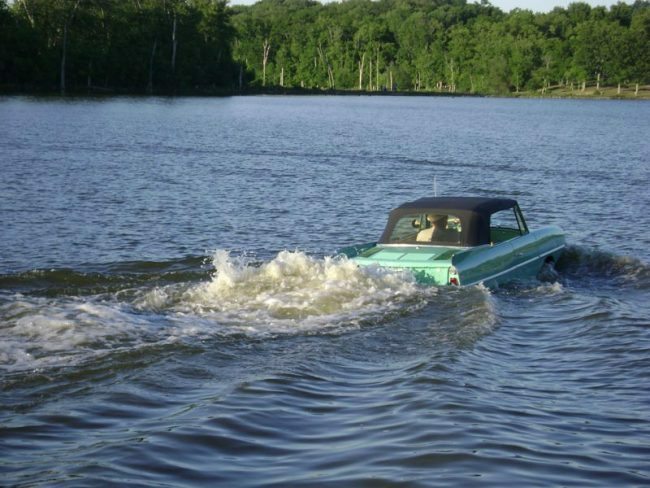 Powered by a Triumph Herald 1147cc motor combined with a Hermes 4 speed transmission it gave the Amphicar a top speed of 70 mph on land. On water its 2 speed transmission offered both forward and reverse to the twin nylon propellers giving the Amphicar a top speed of 7 mph. These speeds combined to give the car its model designation, the 770. The steel hull gave such stability in the water it was deemed unsinkable. Advertised as, “The sportscar that swims.” Amphicars were primarily marketed for the United States. They were produced in only four colors, sand white, fijord green, regatta red and lagoon blue. 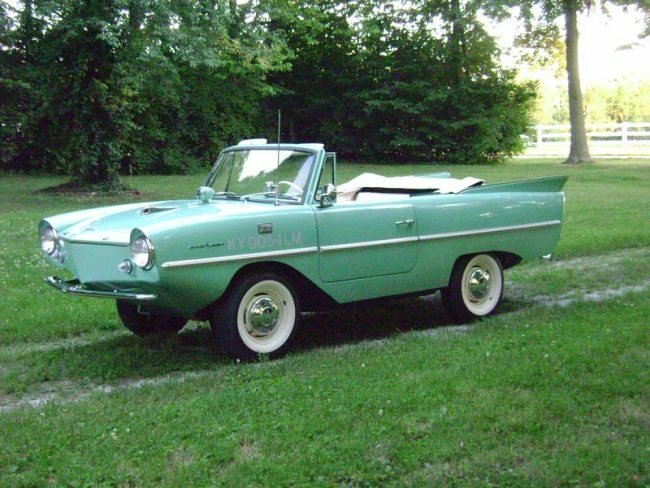 With a selling price of between $2,800 and $3,300 depending on the year the Amphicar never caught on. Initially the Amphicar Corporation planned to make 20,000 cars per year, however production ceased in 1968 after producing less than 4,000 cars. Due to the cost, poor marketing strategy and new emissions regulations in the United States the company went out of business. The remaining parts were purchased by an American, Hugh Gordon, who still sells original parts. It is estimated that 3700 of the total production between 1961 to 1968 were imported to the U.S; of that number it is believed only 500 may still be operable. 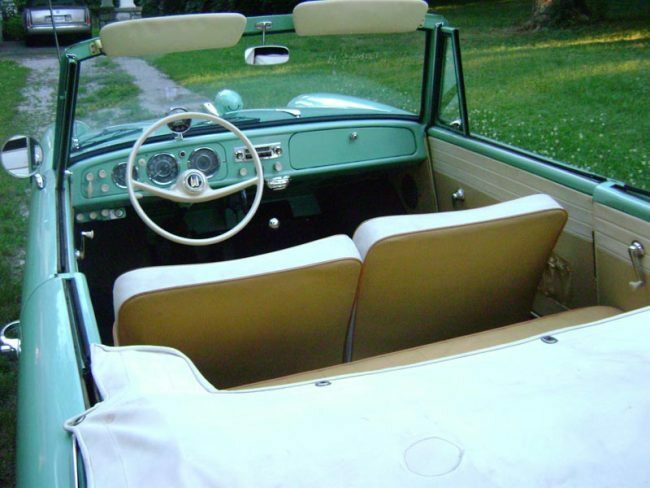 Some notable owners of Amphicars have included former Presidents Lyndon Johnson and Jimmy Carter as well as entertainers Madonna and Alan Jackson. This car was purchased new by the Hanks family on January 9th, 1965 from Howell Auto Sales in Louisville, KY. It was one of the remaining 1964 models, serial number 100506, marine number GK207HE. The dealership had twelve cars to choose from, it was chosen because Mr. Hanks liked the color, fijord green with the white on yellow interior. The vehicle has been stored in a humidity controlled environment since new. There have been only two things changed on this car since it was purchased, tires and seals. The original tires developed flat spots and were replaced, though Mr. Hanks kept the original ones. The transmission was removed and inspected in 1999, new seals were installed as well as new rubber motor mounts. All of the engine components are original. There are no leaks and the hull is rust free. The car is both road worthy and water worthy, making its last marine trip on June 14th, 2012. There have been some minor touchups to the paint over the past forty-seven years, but it is still about ninety percent original. This is one of only 3,878 Amphicars ever built, and certainly one of the last one-owner, low mileage examples in existance. When you drive this car it elicits the same excitement and attention as it did when it was purchased new in 1965. Recent auctions have seen record prices on these cars making this unique example a true time capsule. 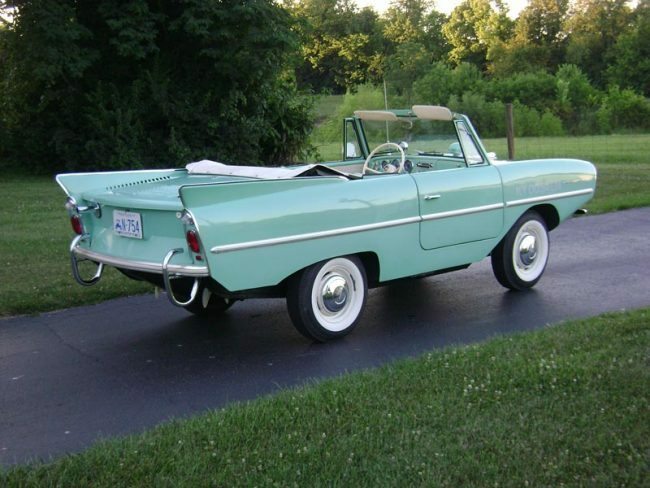 If you have an Amphicar or another collectible you’d like to insure with us, let us show you how we are more than just another classic vehicle insurance company. We want to protect your passion! Click below for an online quote, or give us a call at 800.678.5173.